For many schools the new semester is upon us or rapidly approaching. For some this means all new classes; for others it means possibly some new students. Either way it makes me think about the importance of connecting with parents and guardians throughout the year--not just during the opening days. It's easy to get bogged down with the hustle of the new semester. At the beginning of the year, we make our agendas and materials available to students through our LMS or by other means. We may hand out syllabi or send home welcome letters. But what do we do mid-year? Do we make regular contact with parents/guardians just to keep everyone up-to-date? 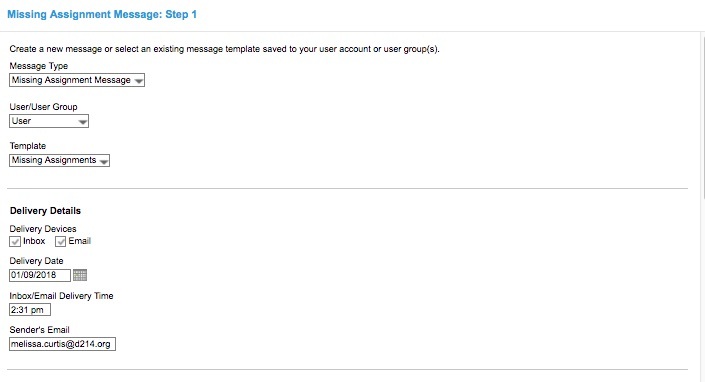 "I truly appreciate communication from the teachers through Infinite Campus. Even though my daughter was very organized and very few assignments were completed last minute, I felt it was beneficial for us knowing about the big projects or reports coming due so we had an idea of the stresses she would be under and to encourage her to make the right choice when other social opportunities arose that would take time away from working on her assignments. I realize she should be responsible for her work, but it helps parent encourage and teach their children how to time manage." 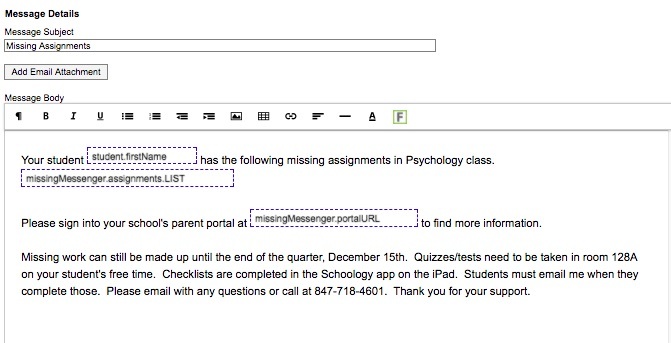 In order to reach out to parents and guardians of students who are missing assignments--and to reach out again to remind students of their own work--Psychology teacher Melissa Curtis uses the "Message Center" screen on Infinite Campus to send form emails to students, parents, and guardians two weeks before the end of the quarter to fill everyone in on missing work! 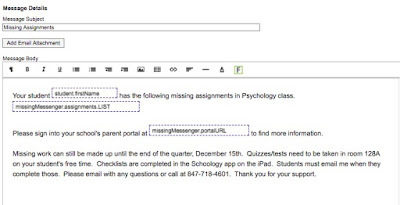 Once she has the template saved, it is easy for her to send out messages to students who have any assignments that are marked as missing in the grade book. The automated email fills in the blanks below with the students' names, the names of missing assignments, and directs them to the portal for more information! 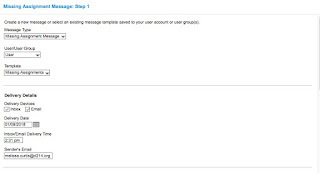 If any teachers would like more information on sending out templated emails like this one, be sure to contact us, and we can show you how and connect you with other teachers who are doing the same! Or if you have other ways you reach out to parents and guardians throughout the year, leave us a comment below!